Neighbourhood Watch is a crime prevention and community safety programme for urban areas. It operates as a partnership between An Garda Síochána and the public. 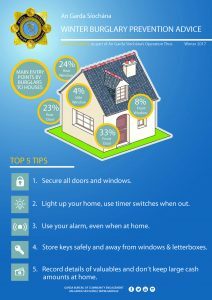 It works on the basis that every member of a community can help to improve the quality of life in the area by keeping a look out for neighbours and reporting suspicious activities to the Gardaí. The Gardai are kept informed by the Community Garda who attends the DCC monthly meetings and any significant matters of concern are discussed at higher level meetings. Garda Ailbhe Boyce is the Community Garda for Dalkey. The Garda Clinics are held in Our Lady’s Hall twice monthly where the attending Garda can assist with forms, authenticating signatures, etc. These clinics are held on the first and third Thursday in each month. It is very important that all incidents should be reported to the Gardai in order to help them in their fight against crime.